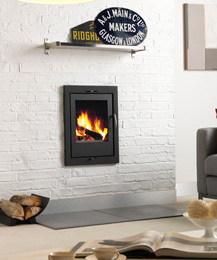 Ild 6 is an efficient and compact insert stove suitable for wall installation. There are two variants of this product; one with classic steel black painted front and one with a more modern look by incorporating a clean black bordered glass front. Both have black painted frames included. This small insert that has been designed with a UK standard fireplace opening in mind, making it an ideal choice when replacing an out dated gas fire or open grate.